Are you looking for change? Who will make things change and when will it happen? This week we feature a quote from the first African American to become President of the United States of America. 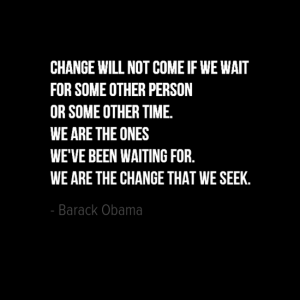 In this speech Barak Obama reminds us that change will not come if you wait and that you can be the that you are seeking. Barak Obama is the current President of the United States of America and the first African American to hold the presidency. Born in Hawaii on 4 August 1961, he is the only child from the marriage of Stanley Ann Dunham and Barak Obama senior. His mother and father divorced in in 1964 and shortly afterwards his father returned to live in Kenya. Obama graduated from high school in 1979 and moved to Los Angeles to attend college. In February 1981, Obama made his first public speech calling for his college to participate in the disinvestment from South Africa in response to the nation’s policy of apartheid. He later transferred to Columbia University in New York city and graduated with a Bachelor of Arts in 1983. Between 1985 and 1988, Obama worked in Chicago for a church-based community organisation that helped to develop communities. Between 1988 and 1991, Obama studied at Harvard Law School. During his time there he was elected as the first black president of the Harvard Law Review. In 1996, Obama was elected as Illinois State Senator, later becoming the US Senator from Illinois before being elected as President of the United States in 2008.